If Dark Rebel Rider were a wardrobe accessory, it would be a dark grey scarf. If it were a time of day, it would be that moment on a Friday evening when you decide to fill your room with some soothing candlelight. Any of you who've ever bought the 99% chocolate from Lindt may have been as amused as I was by the "tasting advice" on the back of the packet. "To fully appreciate all its flavours," it says, "we recommend that you progressively develop your palate through our range of high cocoa content chocolate bars, starting with Excellence 70%, then 85% and finally 99%." This sense of working your way up to (or should that be 'into'?) 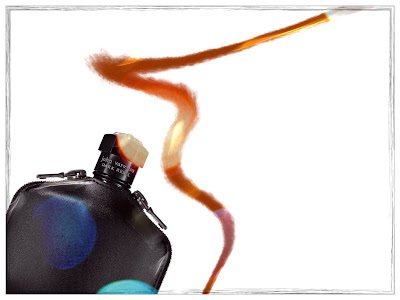 an allegedly superior dark side is, of course, frequently applied to the world of scent. I don't intend to delve into the reductive 'mainstream is bad; independent is good' debate today, but I would like to spare a thought for those compositions which are somewhere in the middle of the 'mainstream to indie' spectrum. The gateway drugs. It strikes me that a few scents which fit that description are some of the entries in the John Varvatos range. Indeed, the label's sole perfumer, Rodrigo Flores-Roux, said in an interview that, when working for the brand, he is often asked to situate 'niche' ideas within a relatively more accessible, more easy-going framework. I'd say that objective has been achieved with Dark Rebel Rider (a flanker of sorts to last year's Dark Rebel). In many senses, it presents an aesthetic that is stereotypically 'niche': an authoritative, petrol-doused leather bolstered by incense, cedar and bitter citrus notes. But I suppose what brings it closer to the demands of the mainstream is the careful handling of its volume knob. The diffusiveness of this stuff never gets out of hand. Indeed, it remains close to the skin at all times, saving its surprises only for those lucky enough to get up close and personal. Evangelical perfumistas may complain that it holds back, but I'd say that there are times for 99% chocolate, and there are also times for 70%. Dark Rebel Rider is a delicious example of the latter, so do give it some of your time if ever you happen to walk past a tester.